Photo Project ’52 Bolivian Sundays’ [week 33, ‘Carefree’]. I used to love it, it’s great fun, perfect play. congrats for the pic. perfect play,I used to love it and practice not too much time ago. the picture is great! I remember days like that. Fun photo! Thank you for stopping by and sharing your impressions… and memories! Looks like a blast. Perfect for this theme. Thanks for the ping and the post! Wonderful picture! 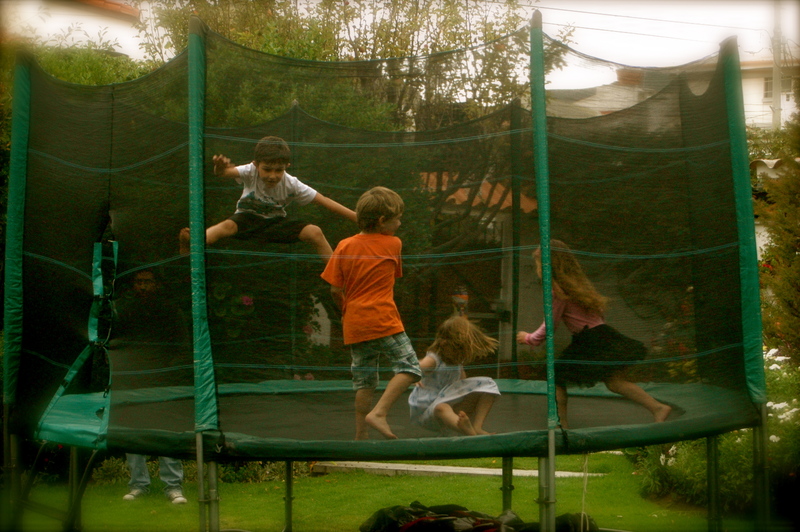 I remember jumping on the trampoline as a kid thinking I could fly if I just jumped high enough…great memories! That’s great and how lovely to be captured in mid air! That one in mid air happens to be my son… 😮 Thanks for stopping by! Pingback: Weekly Photo Challenge: Carefree (Barfleur) | What's (in) the picture? Great capture for carefree….Kids are definitely so happy and carefree while at play. They sure do, Janaline! 😮 The word ‘carefree’ may have been created for some child… at some point in time… 😮 Thanks for stopping by and commenting! I 100% agree — I sometimes miss being that carefree! Glad it’s being enjoyed by a few grown-ups! I do miss being carefree, as well! 😮 Thanks for stopping by! Love this trampoline photo! Thanks for the pingback. Previous Previous post: An open letter to my nomad children. Next Next post: Thoughts on Parenting: ‘Metrics’ for Children’s Summer Vacation – Academics or Fun?